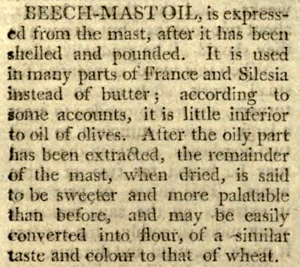 Mast is the ‘nut crop’ of the beech tree (Fagus sylvatica), but, in a broader sense, is the production of an enormous number of seeds. And the phenomenon is not restricted to beeches.It can also been seen in oaks, firs, spruces and pines.Such species are said to have ‘mast years’ and in such years it is basically impossible for animals to eat all the seeds ("predator satiation") so many seeds survive to the following spring and germinate. In the case of beech, records suggest an underlying two year masting pattern but in practice really heavy masts (in England) are several years apart (between 5 and 12), probably due to climatic factors (late spring frosts, summer droughts). Good beech mast years do not necessarily make for good oak or ash mast years, though heavy cropping years are probably more frequent for oak than beech. 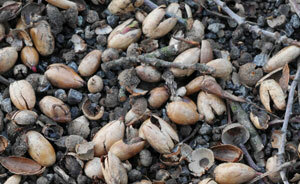 Many animals feed on beech nuts or acorns. The hazel dormouse (Muscardinus avellanarius), despite its name, is also partial to beech nuts. Squirrels (both red and grey) feed on beech mast and acorns. The breeding success of the dormouse and squirrels has been associated with mast years. In the past, pigs and boar fed on acorns and beech mast in woodlands throughout England. The right to pannage, as it was called, enabled ‘commoners’ to fatten their pigs prior to slaughter. The practice is still to be seen in the New Forest where in 2006 the ‘pannage season’ was extended because of the enormous number of acorns. Last year we had a big flood in late spring causing all nut trees to explode. Even trees that thought to old or never remembered ever seeding put out huge numbers of Acorns. Horse chestnut and all the types of Oaks like Burr, red, savanna, I would say I collected 10 different looking Oaks. I did not know we had Black Walnut here so did not visit them to see if they also dazed the squirrels. Wendy with Beech Nut tree. Your tree is healthy and doing what it’s supposed to. Thats why when you plant new from Arborist, those trees don’t seed or fruit because, like you, we don’t need more of a mess than leaves in fall. Your tree might be natural, look around for older beech close by. If Beech is native to your area, it might be the last from long line, genetically one of a kind representing your area…OUR ASH TREE’S MASTED THIS YEAR IN ILLINOIS. IRONICALLY, ALL WILL BE DEAD NEXT YEAR FROM EMERALD ASH BORER, Causing White, Green, Black, and modified ones like Autumn Purple to become EXTINCT in it’s native U.S. of America & Canada. This masting is “God sent” from Mother Nature for our Forest on the Des Plains river bordering Chicago on our west. If your tree is old, send some nuts into a Seed bank which preserves genetic lines….Peace Out…….. I have so many beech nuts falling that they are driving me mad. So many things can affect fruit / seed formation but weather, at the time of flowering, would be a significant factors – coupled with the number of pollinating agents (in the case of insect pollinated species – such as horse chestnut). If you go to Google scholar and search for “mast years”, you get an interesting selection of papers on the topic. Thanks for this Chris, the Small woodland owners have been discussing this issue. (www.woodlands.co.uk/swog) as I was wondering why we had no acorns this year. What would you put it down to? Is it a result of past weather, or the trees predicted weather? There are also very few chestnuts, due to the cold and wet summer, so I am thinking that there will be some hungry animals around!